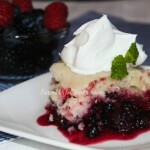 Are you looking for a Mixed Berry Dump Cake recipe that can be made in a Casserole Crock Pot? This recipe is quick and easy and tastes great! I grew up picking berries in the back yard, often eating more than would make it into my bucket. Not much has changed! If we are lucky we have enough left to make this awesome dessert. makes it even more user friendly. I also love recipes that are easy to substitute ingredients because everyone has a picky eater! I like to play around with the fruit mixtures and that is how I came up with this mixed berry version. I used equal parts blueberries, blackberries and raspberries. Strawberries would also taste great. I used a white cake mix but you could substitute a yellow one if you wanted to. I debated whether to use a raspberry or blueberry jello powder mix and decided on the raspberry. Just like the fruit a strawberry jello powder mix would also be great with this recipe. place them in a 9×13 inch pan and bake in the oven at 350 degrees for 45 minutes or until golden brown. Looking for another dump cake recipe? Try my Strawberry Rhubarb Dump Cake version by clicking here. 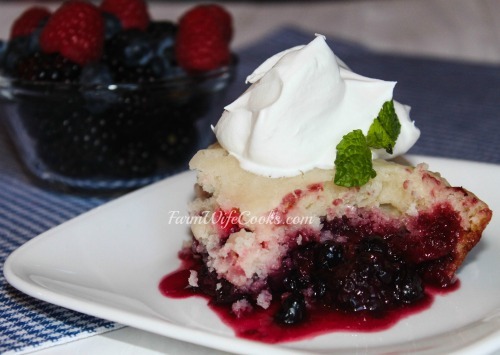 A great recipe for Mixed Berry Dump Cake that can be made in the Casserole Crock Pot. Convenient and tasty! Place berries into the casserole crock pot baking dish. Combine cake mix, water and butter with a mixer until blended. Pour cake batter over fruit and spread to completely cover the fruit. Bake on high for 4 hours or until cake is cooked all the way through. Does this have to be made specifically in a casserole crock pot, or can it be made in a regular crock pot? This looks delicious and I think my mom would LOVE it for a Mother’s Day treat next weekend 🙂 Thank you! You can use a regular crock pot, just watch because the cooking time might be a little different depending on the size and how hot it cooks. I hope your mom loves it! How did yours turn out in a regular crock pot? Also, were there enough ingredients for a 6 qt regular crock pot? Does this cake have to be baked in a crockpot or can I bake it in a regular oven? I don’t have a crockpot. This recipe can also be made for the oven. Instead of putting the ingredients into the Crock-Pot Casserole Slow Cooker place them in a 9×13 inch pan and bake in the oven at 350 degrees for 45 minutes or until golden brown. No oil and eggs. You mix the cake mix with the water and butter listed in the recipe card and then pour over. yes, just try to drain as much of the liquid as possible. Do you have to add in the jello on top of the fresh berries? I haven’t ever made it without the jello so I can’t say for sure how it would taste but I would imagine you would need to add more sugar.